Stéphane Andrieu entrusted his son Jordane with the tasks of restoring the medieval Cluny monastery’s winemaking facilities and finding the right person to oversee both the vineyards and the cellar. In the spring of 2009, former Domaine de Montille oenologist Willy Roulendes was hired as the steward of this historic estate. 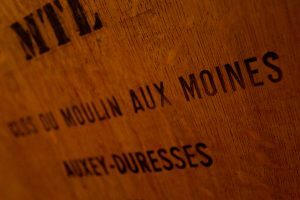 In addition to the Clos’ 3.6 hectares, Jordane and Willy added other prime Côte de Beaune parcels including the 0.80 hectares premier cru monopole Clos Orgelot in Pommard. Heeding the wise counsel of Etienne de Montille and Dominique Lafon, Jordane and Willy implemented an organic regimen and all parcels are now certified organic by Ecocert. Willy Roulendes has since introduced the principles and practices of biodynamic viticulture. Today, all work in the vineyards is conducted entirely by man and horse. No tractors. Homeopathic alternatives to chemical pesticides and fungicides are applied manually. Grass is allowed to grow between the vine rows to compete for nutrients and limit yields but controlled by horse-drawn ploughing when necessary. Harvest is, of course, also carried out by hand with strict selection in the vineyard, then on a vibrating table upon arrival at the cellar before the final selection on a traditional sorting table before pressing.